The festive season is upon us and a Visit from St Nick should be the first thing on your wish list. This High 5 Games creation provides you with Christmas cheer and all the trimmings of the holiday to get you feeling jolly. This 5-reel slot has 243 ways to win and excels when you activate an in-game bonus feature. Whether it’s Wilds, Multipliers or the Bonus Select Free Spins Feature, there are plenty of ways to increase your bankroll. 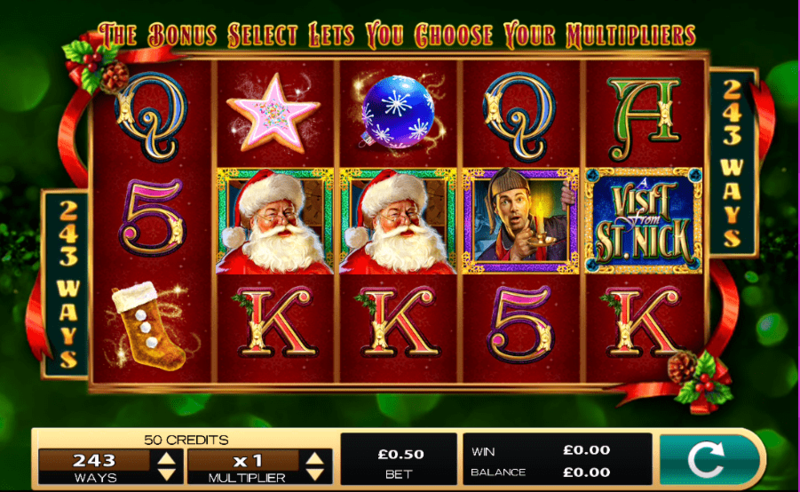 Hopefully, a Visit from St Nick provides you with everything you want for Christmas this year in this online slot. If you are still looking for more, you can view latest slot games today. Embedded inside a Christmas tree backdrop, A Visit from St Nick is a fantastic festive slot that will get you in the mood for Christmas. The 5x3 gameboard has 243 ways to win, a variety of lucrative symbols and a Free Spins Feature to make your Christmas an unforgettable one. Enjoy a seemingly holiday day treat when you play the best spin slots in the UK. When you start playing A Visit from St Nick, you’ll be able to easily determine the various symbol values and pay tables. The low-value symbols include a 5, Q, K and A, whereas the high-value symbols relate more to the theme, including a star, stocking, bauble, homeowner, St. Nick and the game logo. Not only that, but the bonus WILDS will contribute to winning combinations and are accompanied with 2x, 3x and 4x multipliers.